The REALTOR® of the Year is awarded annually to an individual who has exemplified the ideal spirit of a REALTOR®; whether it be a commitment to their profession, or a commitment to the community. The awarding committee evaluates a nominee’s participation in the REALTOR® association, as well as community involvement in civic and charitable organizations. The REALTOR® of the Year acknowledges an individual’s high principles, faithfulness to the REALTOR® Code of Ethics and efforts to further the principles of good real estate practice among other members. Outside of real estate, Cathy has had a varied career including retail sales, owning and operating her own successful business that specialized in fashion accessories, and developing other business and education programs. Cathy can also speak multiple languages; do not be surprised if she greets you with “Buenos Dias.” Our honoree is adventuresome with a list of achievements that include competing in – and winning – triathlons and marathons, and working as a Peace Corp volunteer and employee in Guatemala, Paraguay, and Ecuador, where she climbed several peaks, including Mt. Cotpaxi. Her business accomplishments show her dedication to our profession. Cathy has been the top agent in her office for eight years running. 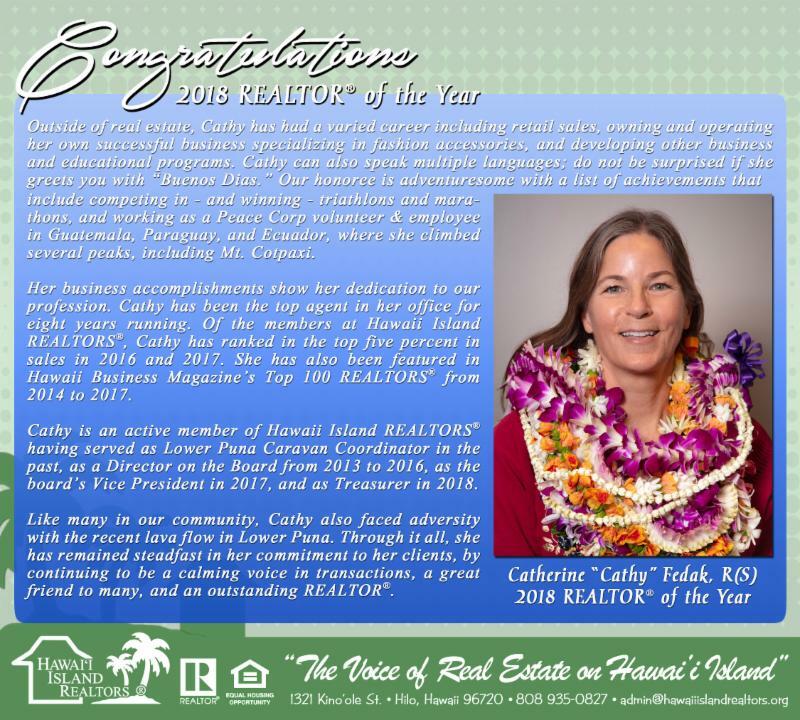 Of the members at Hawaii Island REALTORS® , Cathy has ranked in the top five percent in sales in 2016 and 2017. She has also been featured in Hawaii Business Magazine’s Top 100 REALTORS® from 2014 to 2017. Cathy is an active member of Hawaii Island REALTORS® having served as Lower Puna Caravan Coordinator in the past, as a Director on the Board from 2013 to 2016, as Vice President in 2017, and as Treasurer in 2018. Like many in our community, Cathy has also faced adversity with the recent lava flow in Lower Puna. Through it all, she has remained steadfast in her commitment to her clients, by continuing to be a calming voice in transactions, a great friend to many, and an outstanding REALTOR® .